I am starting to get excited- next weekend we are going to Gettysburg for I don’t know the 100th time or so. I have no way of knowing for sure how many times we’ve visited Gettysburg but I do know we have made at least one visit there every year since 1996. I can only remember one year when we only went once. One year I recall that I was there eight times. It’s roughly a 5 hour trip. I look forward to it every time. The Ranger Programs end next Sunday for the summer so I am looking forward to taking a few of them in. Out on the battlefield unless you are there early in the morning or late in the evening Little Round Top is usually the place that has the most crowds. 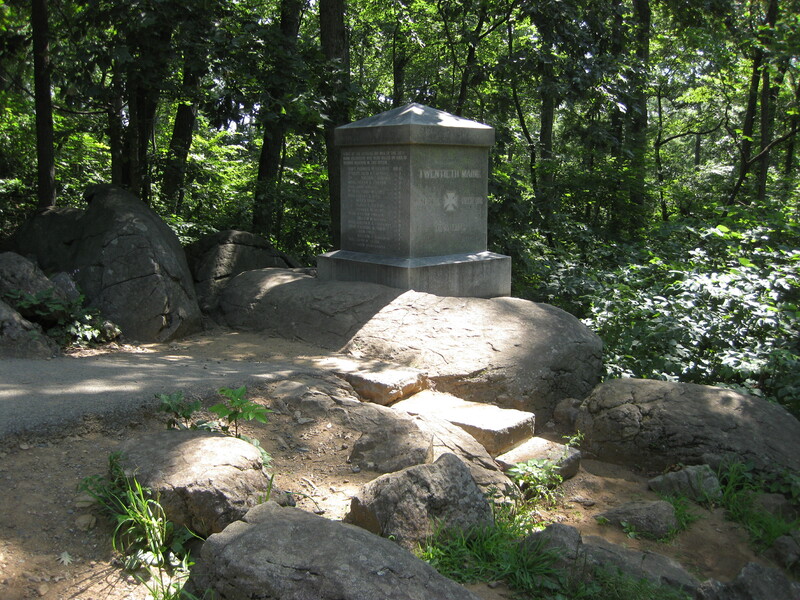 Oddly enough the reason a lot of folks go to Little Round Top is because of Joshua Lawrence Chamberlain and the 20th Maine- but few venture down to where the 20th Maine actually were- and fought. Above is the monument to the 20th Maine at the end of the Union fish hook. Is there any baseball included on this trip? No baseball on the trip but I am going to the Tiger-Pirate game tonight at PNC Park.